Leery, I boarded the DC-4 for the short flight from Windhoek to Swakopmund. I had never flown in a plane with an unpressurized cabin. In fact, the airplane had no windows. Ceiling fans ran the length of the center aisle, the blades stirring but not cooling the warm air. One flight attendant and one pilot made up the crew. Right after takeoff, I stopped biting my bottom lip and started to enjoy the trip. Flying at low altitude, around three thousand feet, I could see an abundance of wildlife roaming the desert floor and the surrounding mountains. Baboons loped along the ridge of a jagged range, screeching and waving their arms as we soared overhead. Below, on the desert flats, herds of antelope grazed. I longed to spot lions or other big cats but didn’t glimpse any, and no elephants. However, later in the flight we flew over a huge water hole with hippopotamuses wallowing in mud. As we came in for a landing at Swakopmund Airport, I commented to my seat companion that I didn’t see a runway. His reply: “If you expected a paved runway, there is none, and no runway lights, and the airport is unmanned.” These comments certainly grabbed my attention, but we landed without incident, and my parents were there to meet me. When I arrived in Swakopmund in April 1974, Dad was wrapping up the water project he was overseeing in the seaside resort. Approximately two years prior, Interpace Corporation had been awarded a $13.7 million contract to furnish thirty-seven miles of prestressed concrete water pipe from the Kuiseb River to Swakopmund, via Walvis Bay. The project was a joint effort between the Department of Water Affairs, South-West Africa Branch, and Interpace’s subsidiary, Lock Joint Pipe Company, South Africa (Pty) Limited. Swakopmund (Swakop), which lies on the northern side of the Swakop River, is sandwiched between the Atlantic Ocean and the Namib Desert; the latter completely surrounds the coastal town. Although Swakop lies in an arid desert, the climate is temperate due to the Benguela Current that runs south to north along the coastline. Because of the current, the ocean is too cold to swim in unless you wear a wet suit. Rainfall in Swakop is low, but on one rare occasion while I was there, the town flooded. Normally, the only moisture comes from sea mist. Fog is common in the mornings, and at certain times of the year, blowing sand can obscure visibility. During my visit I did the usual touristy things. I strolled the seaside promenade, sunbathed on the beach, toured the lighthouse, and walked the streets of Swakop to admire the German colonial architecture. One day, I visited the salt flats. Who would’ve thought that something as mundane as salt pans could be so stunning and colorful, with rich shades of rose fading to stark white? On another trip, I set out for Walvisbaai (Walvis Bay) to see Sandwich Harbour and the bird sanctuary, a birder’s paradise. I spotted pelicans, flamingos, turnstones, and a huge number of waders—easily a hundred thousand birds soaking up some warm sunshine. But the coolest sighting was two kori bustards, the largest flying bird native to Africa. Definitely not the prettiest bird, but in flight phenomenal to watch. Namibia also mines uranium and diamonds. Rössing Uranium Mine is the third-largest uranium-only deposit in the world. The deposit was discovered in 1928 and the mine began operations in 1976 and today produces 2.3 percent of the world’s uranium. Rössing is a member of the Rio Tinto Group of companies, which owns 69 percent of the shares in the mine. Another 15 percent is held by the Government of Iran, 10 percent by IDC of South Africa, 3 percent by the Government of Namibia (with 51 percent of voting rights), and 3 percent by local individual shareholders. The Rio Tinto Group is a British-Australian metals and mining corporation headquartered in London, England, with a management office in Melbourne, Australia. Controversy has swirled around Iran’s 15-percent ownership, but both the Namibian government and Iran have denied that Namibia has supplied Iran with uranium to be used in nuclear weapons. In Oranjemund, Namibia, formerly South-West Africa, the Sperrgebiet (meaning “forbidden area”) is a 180-mile stretch of coastline that was once one of the world’s richest diamond beds, with the stones washing up on the beach, as they did when I visited in 1974. The mine itself encompasses only a fraction of the 180-mile area; the rest is a security buffer. In 1998, after sixty years of sweeping the sands for gem-quality stones, the De Beers Corporation estimated that they had about twenty-five years left to mine diamonds. Today, when it comes to diamond mining, most of the region has been abandoned. Diamonds are now coming from the sea and not the beach. Eventually, the forbidden area will be opened to tourism, or so the rumors go, but at last check the public was still banned from Diamond Area No.1, and De Beers’s cartel, represented by well-armed guards, still patrolled the area. A visitor who stoops to pick up even a scrap of litter risks arrest, and mere possession of a rough diamond can get you a fifteen-year prison term. I also understand that you can no longer tour the vehicle graveyard. Once a De Beers’s earth-moving truck or digging machine enters the grounds, it never leaves. Why? To prevent anyone from smuggling out diamonds in the gas tanks or frames of the vehicles. From the 1920s until today, the vast parking lot has been a massive graveyard of trucks and equipment slowly rusting away. Diamonds may be forever, but mines are not. Next on my must-see list was Welwitschia Plains, hyperarid gravel plains located in the Namib Desert. My real interest in the area was seeing the Welwitschia mirahilis plants. They are endemic to this desert, which lies within Namibia and neighboring Angola to the north. The welwitschia is named after the Austrian botanist Friedrich Welwitsch, who discovered the plant in 1859 in present-day Angola. A photo does more justice to the plant than a description. Some of the larger specimens are estimated to be close to two thousand years old. Two weeks into my visit, my parents, two of my brothers, and I packed into our Land Rover and headed to Mile 72 for what would become one of my favorite outings—grilling and camping on the beach, while Dad surf fished—his favorite pastime. We built a fire in a sawed-off top of an oil drum we had brought with us, then put a pot of water on the flames to boil mussels, rock lobsters, and snails Dad had caught fresh the day before. Any fish he hooked that afternoon would go directly on the hot coals. After dinner, we wiggled into our sleeping bags and listened to the ocean waves lap the shoreline. And not once during our sixteen-hour beach cookout and overnight stay did we spot a single soul. At sunrise, we doused our fire and broke camp, driving north to the pristine Skeleton Coast wilderness, its starkness something to behold. It’s a harsh region but uncannily beautiful and intriguing, with its thousands of shipwrecks and huge animal graveyards of seal carcasses, turtle carapaces, and bleached whalebones, along with, I’ve been told, human skeletons. The bushmen called the area “The Land God Made in Anger,” while the Portuguese referred to it as “The Gates of Hell.” That night, under another star-studded sky, and with full stomachs after a beach braai of grilled crustaceans, mollusks, and fresh fish, we all commented that this was indeed the good life. The Fourth of July. To arrange a special celebration for all employees, Dad contacted an acquaintance and asked if they and family members could camp on his wildlife conservation land near Etosha National Park for a long weekend. His three-thousand-acre farmland was a delicate balance between stock herding, crop production, and wildlife management. Occasionally, he allowed hunting, but only if certain species required culling, such as springbok or kudu, and by permit only. At the crack of dawn on Thursday morning, July 4th, thirty humans piled into their lorries (trucks) and Land Rovers, bound for the interior of Namibia. We headed inland to the west, then north to Etosha, making the six-hour trip in good time. We arrived at the private farmland in late afternoon with enough time to unpack and set up for dinner before dusk fell. After our meal, Dad treated us to an impressive fireworks display in a dry, rocky creek bed, surrounded on three sides by high, barren escarpments. And as we promised the owner, we were careful not to set any fires. Late into the night, we unfurled our sleeping bags, shook them out to be sure no unwanted critters—snakes or scorpions—had taken up residency, and bedded down, staying close to our fires to ward off the chilly desert night. And we kept rifles within reach. We hoped we would never need them to defend ourselves. Under a moonlit sky, I fell asleep—woken occasionally by the loud roars of lions or the distant wail of hyenas out on a hunt. The following day we toured Etosha, on the lookout for big game. The area teemed with wildlife from elephants to big cats to herds of springbok, zebra, and giraffe. Etosha is a huge calcrete pan, and in the language of the Ovambo tribe, Etosha means “great white place.” It is the biggest salt pan in Africa and is visible even from space. The park is home to the largest population of black rhino in the world. The water holes attract immense concentrations of wildlife, and you are virtually guaranteed to see big game. No matter how often you spot wildlife, in Africa or anywhere in the world, you experience an instant rush of adrenaline—their magnificence leaves you groping to express your feelings. But when you see them hunt and kill their prey, not only are you impressed with their grandeur, but also with their power, and you should have a healthy respect for what they could do to you. After two days of big game spotting, we packed our Land Rover and returned to Swakopmund, stopping occasionally for pedestrians crossing the road: a mother ostrich and her brood of six, two springbok with that deer-in-the-headlights look, and four zebra who refused to budge from the center of the road until Dad tapped the horn. Our biggest disappointment of the trip? Despite the region having one of the largest cheetah populations in Africa, we did not glimpse even one. A week later I was introduced to the iconic landscape of Sossusvlei. Here, the winds have shaped the bright orange-red sands into parabolic shapes hundreds of meters high, and the area is home to the most spectacular and highest dunes in the world. Big Daddy is a monster at 1,066 feet tall. To climb it, start early and bring plenty of stamina and water, and you will be rewarded with a magnificent sunrise that casts a fiery red glow on one side of the dune, leaving the other side in shadow. The contrast intriguing to behold. On the crest of Big Daddy comes your second reward: the surreal landscape of Deadvlei—an abstract canvas of black, carbonized camel thorn acacia trees rising from a white clay pan and set against a backdrop of fiery red dunes and a deep blue sky. 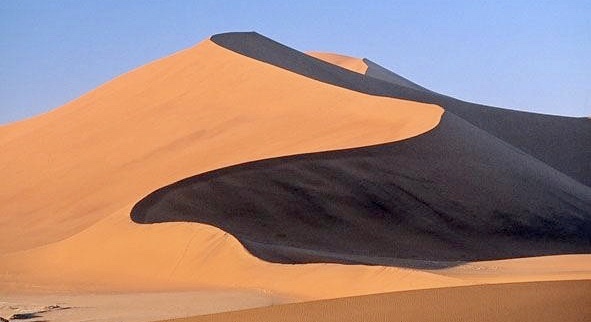 While Big Daddy is the highest dune in the Sossusvlei area, the honor for the tallest dune in Namibia, and the world, goes to Dune 7, so named because it is the seventh dune past the Tsauchab River, which flows through the region. The following weekend, my brothers introduced me to what would be my favorite sport in Namibia—sandboarding. It’s like snowboarding but down a sand dune, not a snow-covered hill. I loved to hear the sand dunes “roar.” The sound can probably be attributed to air trapped between the grains of sand, which are disturbed as you sled down the slopes. Climbing the giant dunes was a real workout but worth the trip up for the thrill of boarding down. Most major roads in Swakopmund were wide and undivided, with one lane in each direction. To keep the windblown sand and dust down, they were sprayed periodically with saltwater. When the sun shone bright, the salt crystals that had gathered along the sides of the roads sparkled under the intense rays. But beware: these salt-surfaced roads could be deceptively dangerous, especially after a morning or evening mist, which made them super slick. And at dusk, drivers were wise to watch for wild animals crossing from one side to the next—in particular, fast-moving antelope. Too soon, summer drew to a close. Awestruck by Namibia, I wasn’t ready to leave the country; the prospect saddened me, but it was time to return to Oregon to job hunt. My family was leaving as well. The water project had been completed, and my parents were being transferred back to Puerto Rico. After two months in Eugene, and with no luck landing a journalism position, I moved to Southern California to look for work and be near my eldest brother Dave. This entry was posted in About Me, Namibia, South West Africa, South-West Africa, Travel on February 21, 2019 by admin.